Looking east along the island. Notice you see both coasts of the island from the viewpoint -- in fact, you see probably 60% of the island in this photo. I got to take a lovely honeymoon with my wife a little less than five months after our wedding. We waited, to accomodate buying a house, moving cities, and generally having far too much to do in the early months after the wedding. We went to the town of Furnas, on São Miguel, in the Azores, more than a thousand kilometers off the coast of Portugal. 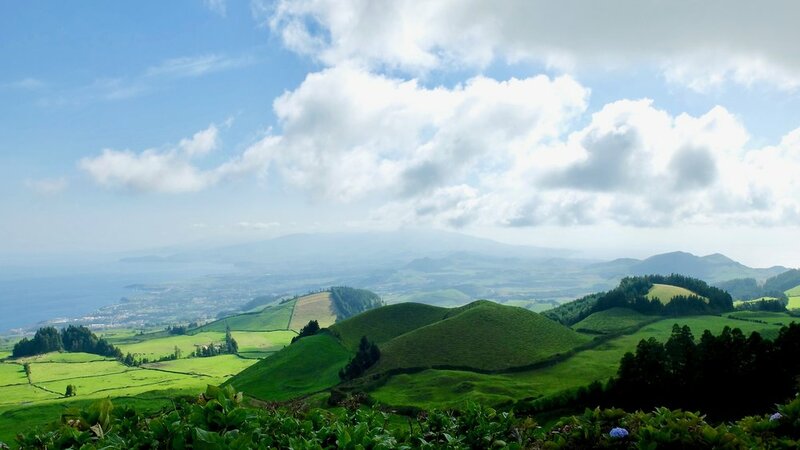 São Miguel is a volcanic island, part of the volcanic island chain that is the Azores. It's the largest island in the group. Volcanoes played a huge part in what made the island so amazing; the geography written in the form of volcanic cauldrons and rocky coasts. The thermal bath in the Terra Nostra park in Furnas is rust coloured due to the high iron content. Lovely though. The garden is huge and full of fascinating species from throughout the world. Furnas, the town that was our home base, sits inside a volcano. No joke. 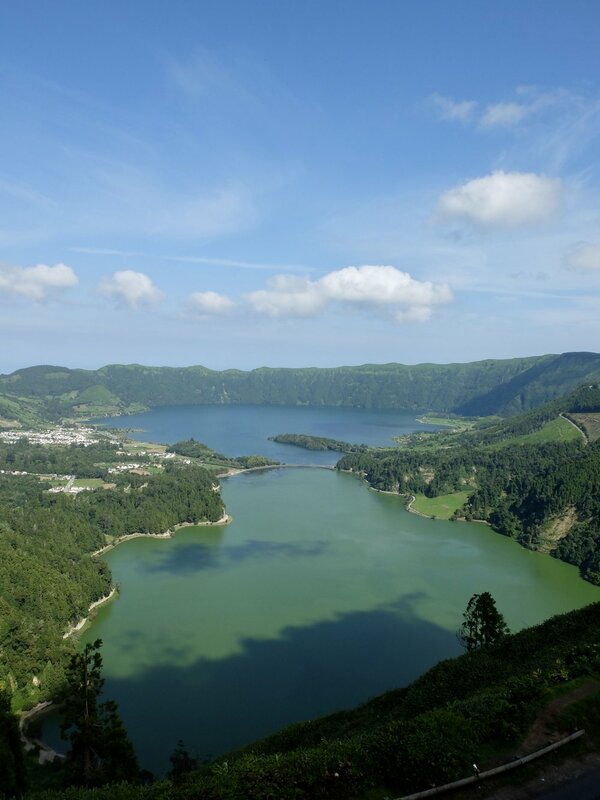 The volcano hasn't erupted in about four hundred years, but powers much of the magic of Furnas. The easy access to volcanic energy is what powers the thermal baths of the Terra Nostra park, and provides the heat to cook a local delicacy cozido das caldeiras, literally a stew cooked by putting it a pot, and dropping it into holes dug in the volcanically heated earth. We stayed in the absolutely gorgeous Terra Nostra Garden Hotel. As you might expect, it's embedded into the Terra Nostra Gardens. These gardens have been cultivated for over 200 years, and are filled with species of plants from all over the world. The hotel itself is a beautiful piece of Art Deco design, and many times I felt as though I had been transported into an episode of Poirot. The island is not large: According to one person we spoke to, circumnavigating the island in a car would only take about 3 hours. For two of the ten days we were gone, we rented a car, and drove the island. 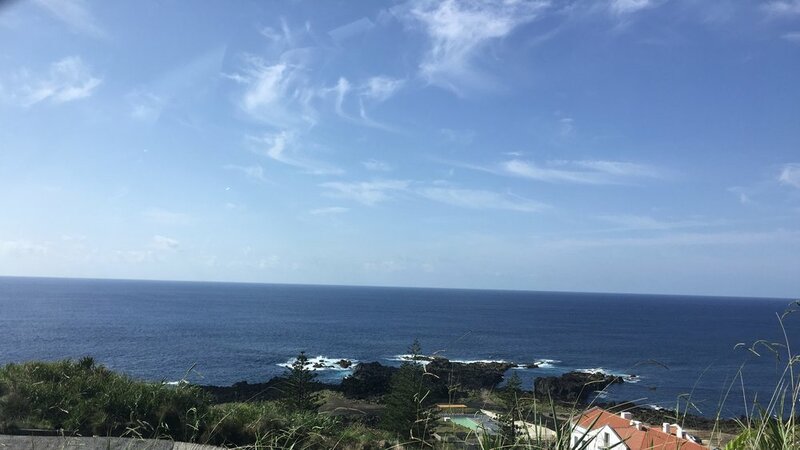 On the first day we had the car, we took only a short jaunt south to the town of Ribeira Quente, with its beautiful Fogo Beach. Fogo beach is broad and sandy, and smoothly deepens out with sand all the way we could feel. Even in mid October, the water was absolutely fantastic for swimming. Wikipedia and an Azores Travel website both suggest the warmth may have also had something to do with hydrothermal vents in the area. Andrea and I had a huge amount of fun just floating and bouncing in the waves. Each time I return to the ocean, I'm reminded of how different swimming feels in salt water. Fantastic. After swimming and exploring the range of the beaches, we retreated to a beachside bar for lunch, coffee and then returned to Furnas. The next day would be our larger drive. On the day we drove the furthest, we drove from the red pin to the purple, and back. Our first stop was Miradou da Boca do Inferno. A fifteen minute hike from where we parked (though, in hindsight, we could have parked much closer 🤷🏽‍♂️). You start climbing a set of stairs, when suddenly you're faced with an incredibly steep slope, looking into a deep valley. Then, as you climb further you take a path with railing on both sides out onto a ridge, ending in a railing circle and an incredible view. Next was Miradou do Rei, or the Kings viewpoint. This is on the south side of the crater, looking north, and home to the spooky remains of the Hotel Monte Palace. After a lunch in Sete Ciades, we talked about where to next. After a bit of research and reading (thank goodness by the way for the profusion of free wifi throughout the Azores. I didn't purchase a SIM for the trip, and we did fine) we decided that we would head over to Termas da Ferraria, a place where volcanic springs heats small coves that interact directly with the ocean. This drive took us to the west coast of the island. I didn't take any photos of the bathing pool we went into, but it was incredible. Having ocean waves mixing hot and cold water around you is fascinating. After this, the long drive home. We didn't do a whole lot more exploring after this, instead preferring to spend most of the time in Furnas, hanging around the hotel and gardens, relaxing. This led us to miss the vents that sit inside the town, but I'm not too upset. The honemoon was amazing. I was so happy we did it, and so happy we took the time away. Enjoyed my honeymoon with my wife! Blocked GitHub on my phone, redirected github emails to my work email. Avoided news sites like the plague. No newspapers. Deleted Tweetbot, Slack as soon as I got on the plane. Spent the majority of the Honeymoon in the moment. Didn't get too obsessed with getting great photos, or making sure every last moment was perfectly documented. Not enough high quality books. Only one book that I really loved, alas. Didn't take enough damn time to take good photos. Pretty disappointed in myself for the photos I took with my X20, because I didn't spend the time to get them right far too often. Though, see the last point above.